Tech Is Dominating Efforts To Educate Syrian Refugees : NPR Ed Half of private donors to Syrian students are funding educational technology, a report says. It's not necessarily what schools need, one co-author says, considering they may lack reliable electricity. Syrian refugees are seen at Elbeyli accommodation facility in Kilis, Turkey. 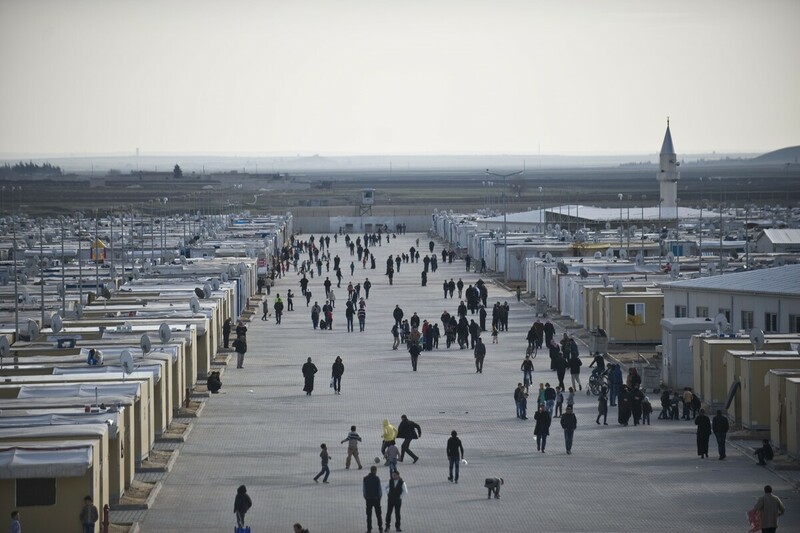 The crisis in Syria has displaced about 1.4 million children and teenagers from their homes. An estimated 900,000 of them are not in school. Historically, in conflict zones, education has taken a backseat to immediate needs like food, shelter and medical care. But more recently, there has been a movement in the international aid community to provide better "education in emergencies." Many private companies and nonprofits are stepping up to do just this, but their efforts are not always well-balanced or well-coordinated, a new report claims. "Many of these companies are based in Silicon Valley, and they do not have a very clear picture of the context they are delivering to," says Zeena Zakharia at the University of Massachusetts Boston, the co-author of the report. Zakharia has been researching education in Middle East conflict zones for over a decade, and she noted the growing role taken by the private sector, both philanthropies and corporations. "I was like, isn't this interesting!" she tells NPR Ed. At the same time, her colleague Francine Menashy, whose research focuses on the privatization of education, had noticed the same phenomenon. The two collaborated on research, interviewing more than two dozen people dealing with the education of Syrian refugees in Lebanon, Turkey and Jordan. Education International, a global federation of teachers unions, released the report. Zakharia and Menashy cataloged a recent and overwhelming surge of interest among donors in supporting education for refugee children. These private organizations often back more than one type of educational activity, but there are clear trends. The authors found that 1 percent of organizations focused resources on social and emotional skills; 5 percent on extracurriculars such as sports; while fully half were focused on providing education technology. To oversimplify a bit, for every donor funding a soccer ball there are 10 backing tablets, educational games, online courses or learning platforms. She says one school leader in Lebanon told her she was approached "every week" with offers of technology. "And I say, 'Oh great, come visit us, see how we operate. And they do not.' "
This is a problem, Zakharia says, because based on her interviews, ed-tech isn't necessarily what existing schools need or are asking for. For example, in many settings with Syrian refugee children, there is electricity one hour a day at best, so keeping devices charged can be a problem. "If you don't have the resources to build latrines or to pay teachers, I mean ... investing in technology isn't well-placed," another interviewee told the researchers. In addition to the desire to help, many of the business donors Zakharia interviewed talked about the financial motivations behind their initiatives, such as improving their brand image, breaking into the lucrative, untapped Middle East market, and testing new innovations. The idea of dual motivation is nothing new for corporate philanthropy, of course. But, says Zakharia, there is always a risk when these business motives come into play. "What happens when the initiative is not seen as profitable? Education is a very long-term commitment."